Yesterday I had a PET scan to see if and how well the debrafenib might be working. I am strangely calm about it all. I have reasons to believe that there is something happening, and yet I really have no idea. I think I am so calm because I know that if this drug is not working, there are other options. That said, I really do hope it is working because that could be 10 months more time I get before I have to move onto the next drug, and the more time I can buy means the more time science has to catch up to me (my beautiful friend Brandi’s philosophy that I am co-opting). The scan itself was unremarkable, other than the fact that it seems like all IVs and blood draws now hurt (for no apparent reason). This is not wonderful but really not terrible. For those who have not had a PET scan, you have to fast for 6 hours ahead of time (probably the worst part of the whole procedure), then you have a small IV placed for a very short time while they inject radioactive sugar. Then you get to hang out for a while (30 minutes for me) while purposely not thinking. Kaiser has a little TV set up and you can watch a variety of rather terrible movies. I chose a BBC animal documentary thing because it was that or watch that terrible Live Sound of Music (I tried that last time. Audra McDonald was the only saving grace and she was only on for like 5 minutes). Then you go lay down on a narrow bed thing, and try to lay very very still while you move back and forth through an open tunnel. It’s not nearly as claustrophobic or loud as an MRI and I generally end up napping or at least dozing. And then that’s it! It’s all over but the waiting. I have an appointment with my oncologist on Monday afternoon, so I’ll get my results then. I did find out that the tech gets a kind of preview image, but it sounds like they can’t really see all of the stuff going on, so I don’t know if he could even tell me if he wanted to how things were looking. Let’s hear some fun stuff about Emmie, shall we? Last night, I took Emmie to a special music therapy class. Emmie has shown a lot of sensory sensitivity to things in the past, including music and noises. She often protests when we play music at home and she gets mad at me if I sing at any time other than bedtime (and even then I rarely get to sing to her anymore). At a friend’s recent birthday party, the birthday girl had a truly awesome musical duo (Jeff & Paige, check them out, especially if you love clever songs or songs about science!) and Emmie spent the entire concert in my lap, holding down my hands so I couldn’t clap or do any finger play. So I was really excited to hear that we could join this special class for kids with special needs, especially since she doesn’t have any diagnosed special needs. I was really hoping that this might be a more gentle and forgiving environment for her to get used to music. I am so proud of her. She also recently started taking ballet classes and has done far better than I ever could have imagined. She is getting so brave and is able and willing to do so much more than even a few months ago. She even rode a pony at the stock show all by herself (well, she had her good friend Cameron near her) and LOVED it! Here is our little ballerina showing off her “tippy toes.” She can walk like this across a whole huge studio already! She is absolutely loving it and I am loving watching her carry on the tradition of dancing for the third generation. 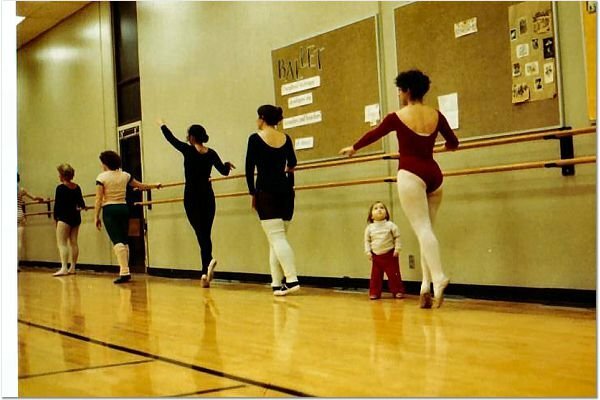 Here is a picture of me, a bit younger than Emmie, watching my own mama dance. Love of dancing is so much a part of my relationship with my own mom, and I’m SO happy to have been able to see Emmie take her own first classes as a dancer. I hope that she grows to love and appreciate dance as she get older, whether or not she continues to pursue dance herself. (Frankly, I hope she does what my mom and I did, which is enjoy it as a hobby, but not destroy our bodies or our lives pursuing an almost impossible dream of professionally dancing). I just love this. I have been thinking about you and the PET results. I hope the weekend is good to you with enough happiness you aren’t too anxious. As always, I am here in any way I can help <3 Just love Emmie's tippy toes! I always fall asleep in PET scans too, I actually kind of find it oddly soothing in there since it is so cool and quiet. Science is totally doing its thing, just think about how there are more available treatments than when you were first diagnosed. That is what I always try to remind myself 🙂 I am wishing you great results and hey why not go crazy and hope that you are an outlier on this drug and far surpass the 10 month statistic. Someone has to be the outlier right? Love you lady! May we all be outliers! I know, it’s totally mind blowing how many more treatments there are than even 3 or 4 years ago. Just 2 more in the past few months! Keep on keeping on, science! P.S. the dancing pictures of Emmie and you and your mom are awesome! I LOVE these photos and everyone on their tippy-toes. I can’t stand on mine anymore. I almost can’t stand on my feet anymore 🙂 but I sure do remember when I stood in the Bridge St. library about age 9 with a ballet book open on the library table, trying to look like the ballerinas in the book. You brought back happy memories while you made some for you and Emmie and your mom. Love you so much.